Cameras are ubiquitous today, and, from a technology perspective, the revolution is just beginning. Video cameras are becoming smaller and cheaper while the Internet is enabling unlimited live webcasting. 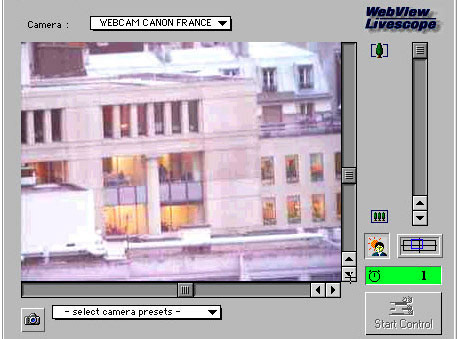 Web camera usage has grown from one in 1991 to hundreds in the mid-1990s to hundreds of thousands today. Video cameras the size of postage stamps can be procured for under $100, and will certainly become even smaller and cheaper. To many, this is good news. Public webcams enable remote users to see what they would otherwise need to visit, and empower local subjects to have a voice and a face to the outside world. Private webcams empower friends and family to see each other remotely, and to check up on the safety of their homes and their loved ones. But there is a dark side. While hidden cameras are clearly an invasion of privacy, visible public cameras can be as well. A camera placed in a legally valid site can peer into otherwise private spaces. Their connections to the Internet enable arbitrary numbers of users to watch anonymously. And telephoto lenses enable cameras far greater vision than that of the human eye. Imagine looking out your window and seeing someone on top of a building with a large telescope looking down at you. Now imagine the nightmarish vision of seeing thousands of people on top of the building with telescopes looking down at you. Laws and conventions acceptable for a single live gaze do not scale for remote multiple ones. On a personal note, I'm a camera-guy. For over twenty years I've worked as an artist and researcher exploring new ways to represent place, work which often involved custom-designed cameras for 3D, immersion, and interactivity. Last fall I moved to a small town in Japan for an artist residency, ostensibly to continue my work with VR and webcams. But the dark times caught up with me and I felt compelled to ask some deeper questions, like, when cameras are everywhere, is it possible to become invisible from them? The more I learned, the more I realized the answer is, well, yes and no. I began by aiming an inexpensive laser pointer directly into the lens of a video camera. The results were striking. The tiny beam neutralized regions of the camera sensor far larger than the actual size of the beam. Properly aimed, it could block a far-away camera from seeing anything inside of a large window. Then I looked around the Web. Relevant articles existed but were highly scattered. Not surprisingly, a lot of data exists in the military literature (much of which appears to be getting "re-classified" and disappearing from the Web day by day). I realized that I could more or less cover everything there is to know about camera zapping during my residency, both in terms of practical information and of larger metaphors. I have some artistic and ethical discomfort with this work. It's divided my artist colleagues into those who see a new activist tool and those who liken it to burning canvasses. Indeed, is an anti-tool a tool? Then there's the question of releasing potentially useful information to criminals and terrorists. Perhaps, but anyone who really wanted to knock out a camera wouldn't waste their time with harmless, temporary techniques. My interest and motivation is to provide the creative community with some stimulating and provoking stuff. These are stimulating and provoking times. This is a report of my findings. Camera zapping is possible because cameras are not perfect machines. Two such imperfections are blooming and lens flare. Blooming is the technical term for when a portion of the camera's sensor is overloaded, resulting in "leakage" to neighboring regions. For example, a candle in an otherwise dark setting may cause blobs or "comet tails" around the flame. Many video cameras today advertise "anti-blooming" capabilities, but it's ultimately a matter of degree. Most can indeed handle a candle light without blooming but almost certainly not direct sunlight. The other relevant imperfection is lens flare, caused by unwanted light bouncing around the glass and metal inside the camera. Multi-coated optics and good design can minimize lens flare but not completely eliminate it. For example, it is virtually impossible to eliminate the multi-facet reflection of the lens' diaphragm blades in today's cameras when they're aimed at the sun. Another imperfection common in digital cameras occurs in the electronics downstream from the camera sensor. Often, when one small portion of an image is unnaturally brighter than its immediate surroundings, the electronics get confused. The result may be large digital "blocky" artifacts in the image. In addition to these imperfections, cameras' strengths can also contribute to their weakness, for example with long, or telephoto, lenses. These lenses act as telescopes, allowing the camera to fill its frame with a magnified image. Since the field of view is small, the amount of light needed by the sensor is proportionally larger. Consequently, telephoto lenses are typically large, making concealment more difficult and detection easier. Further, telephoto lenses exhibit a strong retro-reflective effect, the bright reflection caused when viewing such things more or less on-axis with a light source. Examples include animal eyes viewed with a flashlight (held close to the observer's eyes), "red eye" in flash photography, and the reflection of car headlights from retro-reflective material common on today's running shoes. When a telephoto lens is aimed at you, you will see a "glint" in the lens if you are shining a light in its direction. Lasers are near-perfect monochromatic light sources, in that they emit a single narrow wavelength, one pure color (actually some lasers emit several pure colors). The first lasers were made of glass tubes with polished mirror ends and had the additional feature of emitting collimated light, a parallel beam so precise that it could be extremely narrow (and therefore concentrated) or could converge to a microscopic point. It is important to understand that a parallel beam of collimated light does not lose any of its brightness travelling through empty space. Here on earth, the atmosphere has enough density to diffuse and weaken a collimated beam. But on a clear day or at night, a small bright spot from a well-collimated laser will remain a small bright spot for distances of hundreds of meters. The solid-state revolution that replaced vacuum tubes with silicon chips had a similar effect on lasers. Solid-state technology allowed lasers to become smaller, more efficient, and much cheaper. Useful new industries emerged, such as laser printers and laser-scanning at supermarket checkout counters. Useless ones appeared as well, such as cheap home laser light shows and laser pointers. Laser pointers represent a case study of what happens when technological advancement and high volume production reduce costs so much that a product simply happens, regardless of need or utility. Laser and other light-based pointing devices were originally made to help a lecturer highlight something on an accompanying projection screen. So in theory, there need not be more pointers in the world than lecterns or projection screens (or lecturers). But because laser pointers could be made and sold for a few dollars, they found a market as a novelty item. Red laser pointers can be bought on the Web today for $1 or $2 each, while green ones are much more expensive ($200-$400) and blue ones are still in commercial development. Today lasers come in extremely wide varieties of type, wavelength, and power. (Everything one would ever want to know about lasers can be found on the Web at Sam's Laser FAQ.) They range from lasers capable of destroying missiles to tiny lasers that create images directly on the human retina. Though lasers are often associated with danger (think Goldfinger), their hazard level is related to power, wavelength, and concentration, but primarily to power. Lasers are classified into four classes (two of which have sub-classes). These range from "Class I" lasers which are deemed never harmful (e.g., laser printers), to "Class IV" lasers that can blind, burn, and sometimes cut through steel. The big dividing line lies between Class IIIa and Class IIIb lasers, with the major criteria being whether or not the laser emits more or less than 5 milliwatts. Class IIIb and Class IV lasers must be registered in many countries, though a casual Web search suggests it's pretty easy to buy serious Class IV lasers if one desires. All off-the-shelf laser pointers are Class IIIa lasers, emitting light from 1 - 5 milliwatts. The official view is that they cannot burn or damage skin, but can produce "spot blindness" under the right conditions and should have a "danger" label attached. Spot, or temporary, blindness can indeed be hazardous, for example, while driving a vehicle. But, contrary to the popular belief, not a single instance of permanent eye damage from laser pointers has been recorded anywhere, according to a report published in the Industrial Safety and Hygiene News in May 2000. In addition to spot blindness, laser pointers can get people into other kinds of trouble. Today, many sports arenas and concert halls ban laser pointers. 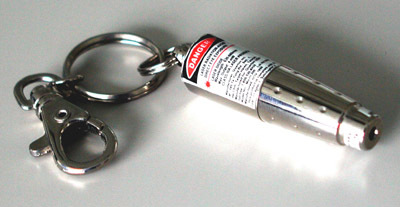 Various direct and indirect laws can be used to cite irresponsible use of laser pointers as a misdemeanor. And since the beam from a laser pointer looks the same as the beam from a laser-sighted firearm, you don't want to aim your laser pointer at someone carrying a weapon. In June 2000, LAPD booked an unarmed juvenile, who aimed a laser pointer at an officer's torso, for "602 WIC 417.26 (c) P.C., (Laser Scope Pointed at a Police Officer)." Using bright light as an aggressive tool goes back to ancient Greek mathematician Archimedes and the legend that he burned invading Roman ships with large mirrors and reflected sunlight. The activist art group, Rtmark (pronounced "arteemark"), inspired by the Archimedes legend, distributed 1,000 hand-held mirrors to protesters at the 2001 G8 summit in Genoa, to use against the police by spot blinding them with sunlight. Community-made maps showing the locations of surveillance cameras in public spaces are appearing on the Web. For example, the NYC Surveillance Camera Project has mapped over 2,000 surveillance cameras in Manhattan through a network of volunteers. The artist/activist group Institute for Applied Autonomy created a web-based application allowing New Yorkers to find walking routes to avoid surveillance cameras. Other forms of artist activism against surveillance cameras are more light-hearted. The Surveillance Camera Players, a New York based group, perform unannounced street theater "for the entertainment, amusement and moral edification of the surveilling members of the law enforcement community." The SCP organized a protest against surveillance held on September 7, 2001, with 22 participating organizations in 6 countries. Currently the SCP has several satellite groups, including in Italy, Sweden, and Lithuania. A Google search of "anti paparazzi device" yielded two hits, both about near-identical devices called "Eagle Eye" and "Backflash" (and both unfindable as actual products). These devices apparently couple a light sensor to a flash unit: when a flash of light is detected, the devices instantaneously flash back. They're both small, made to be worn, and claim to obscure a portion of the photographic image near them whenever a flash is used (ostensibly as protection against intruding photographers). If these devices work, they obviously would only work for still, flash photography. The gold vein of camera zapping material can (or could) be found in the military literature. Indeed, the race to build the first laser (built in 1960) was fueled by DARPA funding. During the Cold War, both the Pentagon and the Kremlin spent billions of dollars developing high-power laser weapons, which continued during Reagan's "Star Wars" initiative in the 1980s and continues today. But as the silicon revolution made lasers smaller and more efficient, the international military community looked into additional opportunities. Two such opportunities were "antisensor" and "antipersonnel" weapons. Antisensor lasers are capable of scanning a region looking for "glints" of reflected light coming from lenses aimed at them, then switching to a high energy laser capable of overloading or destroying the sensor (or whatever) behind the lens. The U.S. developed such a system called the Stingray and deployed two tank-based prototypes in Saudi Arabia during the Gulf War (they allegedly were not used). The Stingray's range of operation is claimed to be several kilometers. It's not clear if (or how) the Stingray could discriminate between lenses and eyeballs, or between sensors behind a lens and human eyeballs behind a lens. Antipersonnel lasers are made to "dazzle" (the technical term for spot-blindness plus its effects, such as disorientation and delay). One such system developed by the U.S. Air Force is the Saber 203. It's designed to fit in the grenade launcher of an M-16 rifle and emits a beam in-line with the rifle's scope, with an effective range of 300 meters. Its 28 milliwatt laser is considerably more powerful than the 5 mw laser pointers, but it is claimed to be below the threshold of eye damage. The line between antisensor and antipersonnel lasers is vague, since there is nothing preventing a soldier from using a Stingray to permanently blind soldiers in the battlefield. The Human Rights Watch and the International Committee of the Red Cross led a campaign for a United Nations ban on blinding laser weapons, which was adopted in 1996. Some believe this only drove such development further into secrecy. Rumors persist that Israel acquired U.S. Stingrays after the ban, and that China has been making a cheap version of the Stingray called the ZM-87 that can blind soldiers 2 miles away and disable soldiers 7 miles away. It remains uncertain whether any 100% successful antisensor detecting system actually exists. First field tests were conducted simply with an inexpensive laser pointer aimed into the lens of a video camera. At close range (1 - 5 meters), the beam was easy to aim by hand. 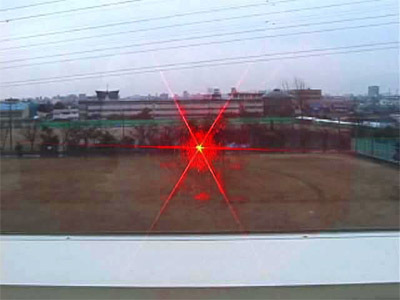 The laser beam almost completely obliterated the image, covering it with a red starburst.The effect completely disappeared when the laser was aimed away, leaving no trace of any permanent damage. Laser pointer aimed at video camera from 3 meters away. This cheap laser pointer emitted an oval-shaped beam (as is often the case) that was about 2mm by 4mm in diameter at very short distances, and expanded to over 5cm by 10cm at 100 meters (due to cheap collimating optics). In medium and bright light, it was difficult to see with an unaided eye. The obvious solution was to couple the laser to an optical scope and pre-calibrate them. A simple prototype system was built with a $30 mail order 5mw red laser (635 nm wavelength, which appears much brighter than 670 or 690 nm red) and a $10 rifle scope with a 4X magnification (Tasco Rimfire, made for small game hunting). The laser and scope were secured together and the cross-hair adjusted to center on the laser beam at 100 meters. Through the rifle scope, the glint reflected from the lens was indeed apparent, particularly when the camera lens was zoomed in. It was easy to intermittently hit the lens but difficult to maintain aim by hand. A second prototype expanded in several directions. First, it is tripod-based, with a precision head allowing independent adjustment of its 3 axes (Bogen/Manfrotto "Junior Geared Head," complete system costs around $200). Then, a larger rifle scope was used for a bigger, brighter image (Tasco World Class 3-9x zoom, $70). Finally, the cheap laser pointer was replaced with a laser gun sight, which has the same Class IIIa power rating but much better optics, resulting in a more circular and collimated beam (Beamshot 1001 for $110). These gun sights also have adjustment screws to align the beam, durable metal cases, and many options of mounting hardware. So, for under $400, a rather serious camera zapper can be assembled. The system was portable and could be quickly deployed. Aiming was extremely critical, and at long distances, very careful fine tuning was necessary. But when the camera was aimed in the direction of the zapper and zoomed in, the glint reflected from the lens was very obvious. This system can work well for cameras which are visible and stationary. If either the camera, or target, is moving, then some form of aiming and dynamic tracking is required. One solution is to do it ourselves. 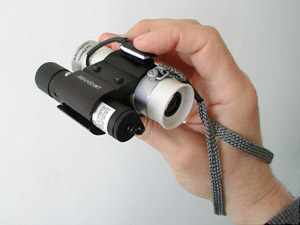 A third prototype was built to be small and hand-held for near and medium range moving cameras. The result was made with a Beamshot 1001 laser gun sight and a small monocular made for golf range finding (Tasco Golf Scope, $20), basically a small telescope with a grid-like reticule inside. 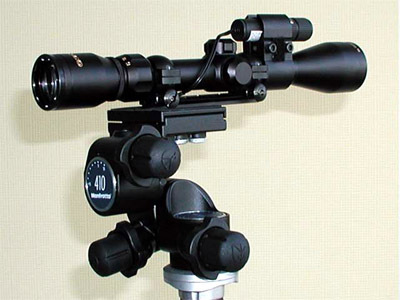 Unlike a rifle scope, its eye relief distance is zero, which makes it comfortable to use hand-held. This new system could fit in a pocket and was very easy to use. It turns out that precise calibration was not necessary, since the beam is easily visible in the scope at near and medium range distances. If one wanted to scare away a news cameraperson, this system would be ideal. It would indeed be a achievement to be able to wear a small device that prevents your image from ever being seen by a camera. (I once recklessly predicted such a device myself.) And though it may be possible, it would not be without limitations. One limitation of using lasers to zap cameras is due to their purity of color, which makes it possible to filter out. Filtering can be done either optically (e.g., using a special green filter to filter a red laser) or electronically, downstream from the camera sensors. Neither are perfect solutions, and at best, filtering may provide a recognizable image but without full color. Filtering can also be counter-measured. The best method is to use 3 lasers (e.g., red, green, and blue). The next best method is to use a green laser, since most of the signal coming from a color camera sensor is from the green element, the color to which our eyes are most sensitive. The military solution is to use "wavelength-agile" lasers that can randomly change color, rendering any filtering useless. Another limitation is how to track a moving camera automatically. In the long term, this is (arguably) solvable using computer vision techniques. The problem is more solvable if a human operator first constrains the range and an automated system does the fine tuning. The biggest limitation - and this is where things ultimately get depressing - is detection. Look out any window and ponder that cameras can be the size of buttons. Cameras don't even need lenses; they can use "pinholes." It's my conclusion that the problem of detecting cameras is ultimately unsolvable: if someone wants to hide a camera, they can hide a camera. There is good news. Long, telephoto lenses, whose powers are greater than human vision and therefore of special concern, are detectable. At least for the foreseeable future, cameras that see far away can also be seen. So in the end, two applications of camera zapping are immediately possible. If a camera's location is known, and can be seen, and is stationary, a tripod/rifle scope/gun sight laser system can successfully zap it, even at distances greater than 100 meters. If a camera is roving, a golf scope/gun sight laser can intermittently zap it by hand with little effort. The umbrella issue, on top of camera zapping, is perhaps most provocative of all: how does one stop, or at least gain control of, representation of oneself? Suppose, for example, you wanted to eliminate every instance of your name that appears in a Google search. You could, in theory, contact each website and demand they remove your name (though it's not clear what, if any, leverage you might have). And of course, it would be naïve to assume that every database with your name in it will be found with a Google search. One approach is simply to not care about one's representation. Whatever alternative or optimal approaches may exist, it's clear that "de-presentation" is as fundamental a force as re-presentation as we approach the brave new world of massive databases and cameras everywhere. Some new and difficult issues need to be addressed. Camera zapping may provide a robust metaphor for these deeper issues and help to stimulate and provoke solutions. The author gratefully acknowledges support from the Institute of Advanced Media Arts and Sciences, Ogaki, Japan, and the IAMAS community, particularly President Itsuo Sakane and Professor Hiroshi Yoshioka. Special thanks to researcher Arnaud Pilpre of the Human and Object Interaction Processing Group, Softopia Center, Ogaki, Japan, and a very special thanks to artist Marie Sester.